Back in Kathmandu, relaxing at the Yak and Yeti Hotel at last. After leaving Pangboche, we had two very long days of descent back towards Lukla. While every meter of descent meant thicker air and less altitude-related issues, the 8-10 hours of descent were challenging in their own way, especially since we had been on the trail for over two weeks. Despite our exhaustion, the excitement built as we approached Lukla and knew that a comfortable bed and a hot shower were only hours away. 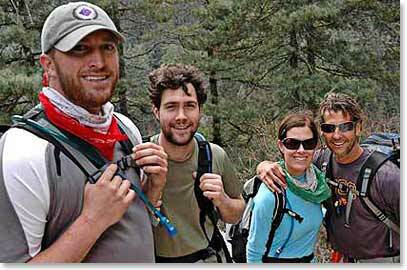 Upon arrival in Kathmandu, Todd and Joselyn collapsed into a deep slumber for over 15 consecutive hours, while Thom and Guy immediately commenced a local pub crawl. On our way down, we passed and were greeted by armed Nepali soldiers on their way up to Base Camp. The Chinese Olympic Torch Summit attempt has blocked all other climbers from going above camp 2 until at least May 10th, on both the Tibetan and Nepalese sides of the mountain. The Nepalese soldiers are staying at Base Camp to ensure that no climbers/protesters interfere with the Chinese climbers. Our last night in the Himalayas was a celebration of our trek with our entire supporting team (a 9 person team of cooks, porters, guides, and a yak logistics specialist). Following a great final meal, we exchanged a few gifts, shared some kind words (some through Ang Temba's translations), and jointly headed to a local billiard joint for beers and laughs. The April 10th election went smoothly for the most part and there are no election-related dangers in Kathmandu. The Maoist party has captured a big majority of the representatives to the constitutional assembly, and the locals seem happy about the results in anticipation of a step towards democracy. Guy and Thom's Loco Fantastico Himalayan Culinary Adventure (guest starring Todd Miller): Chhaang (Nectar of Gods) is a popular alcoholic beverage in the eastern Himalayas. Similar to moonshine, each Sherpa farmer homebrews a batch of this unfiltered rice wine from a recipe passed down over the generations. Guy, Thom, and Todd say "Yum!!! This stuff is great, especially at 13,000 feet!" Yeti Watch 2008: Upon Check-in at the Yak and Yeti Hotel, the front desk agent informed us that we had a visitor waiting for us at the bar. Shockingly, the Yeti himself had turned the tables and tracked us down. We tried to flee, but we were no match for his overpowering yet motherly gentle strength. Over a few wine spritzers, we were able to settle our differences. The Yeti was tired of always being on the run, and we were emotionally exhausted from our hunt. Together we agreed that in exchange for keeping our research and all evidence of the Yeti's existence to ourselves, the Yeti will not bite our faces off and eat us. Though we will obviously miss out on lucrative book and movie deals, we now can sleep at night knowing in our hearts that the Yeti does exist in the snowy Himal. On a side note, the Yeti has breath that smells faintly of rotten cabbage and antifreeze, but can sure take down wine spritzers like a pro.